China in order to curb the carbon emission, the government is inclining towards using renewable energy source and casting out the coal mining and coal-burning power plants. In 2018, China is expected to install 54 GW (Gigawatt) of solar energy, surpassing the capacity of Japan. In 2017, it has already installed 43 GW of solar power. Thus, solar panels manufacturing in China is continuously increasing with the rising number of solar energy projects. In 2017, China has installed the world’s largest floating solar power plant with a power output capacity of 40 MW. China in the first quarter of 2017 produced 170,000 tons of polycrystalline silicon and also it has exported solar panels of nearly 38 GW capacities, equal to the 37% of the global solar panel installations. Advancing technologies have increased the scope of solar energy such as concentrated thermal energy that heats the fluid to create steam and generate the electricity. Parabolic trough, solar dish, and solar power tower are the major types of solar thermal power plant, being largely installed in the country. Goldstein Research analyst forecast that the China solar panel manufacturing industry is set to reach nearly USD 84.8 billion by 2024, growing at a CAGR of 12.0% over the forecast period (2017-2025). On the basis of technology, photovoltaic cells segment dominated the market with a share of nearly 60% on the back of its continuous use in different sectors of the economy. Over the forecast period, the solar thermal market share is expected to grow at a CAGR of 14.3%. The report covers the present ground scenario and the future growth prospects of the solar panel manufacturing industry for 2017-2025 along with the market players’ analysis. We calculated the market size and revenue share on the basis of revenue generated from major players in the China region. 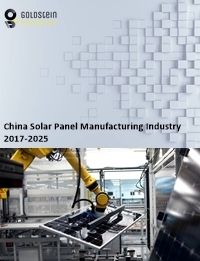 China Solar Panel Manufacturing Industry Outlook 2017-2025 has been prepared based on an in-depth market analysis from panel manufacturing industry experts. The report covers the competitive landscape and current position of major players in the China solar panel manufacturing industry space. The report also includes Porter's five force model, SWOT analysis, company profiling, business strategies of market players and their business models. “China Solar Panel Manufacturing Industry Report” also recognizes value chain analysis to understand the cost differentiation, pricing models to provide a competitive advantage to the existing and new entry players. Our China solar panel manufacturing industry report comprises of the following companies as the key players: CHINT Group Corporation, JA Solar Holdings, Sungrow Power Supply Co. Ltd, Jinniu Energy, China Sunergy, Hanwha SolarOne, Huawei Technologies, Trina Solar, Xiamen Kehua Hengsheng Co. Ltd, Yingli Solar, Jinko Solar, Renesola, etc. The study was conducted using an objective combination of primary and secondary information including inputs from key participants in the panel manufacturing industry. The report contains a comprehensive market and vendor landscape in addition to a SWOT analysis of the key vendors.